One spring afternoon, Sulin Grelinek sat in the parlor of her large home in Shenkuu, waiting for her guests to arrive. The family butler, a Buzz named Lai, was setting out tea in preparation for the guests’ arrival. Sulin’s daughter Mirsha, a brown Gnorbu who was just over two years old, sat on the floor, staring out the large window at the cherry tree in the yard, watching intently as its blossoms spiraled to the grassy lawn below. A loud knock sounded on the door, and Lai hastened to answer it. Sulin gave her elaborate hairdo one last adjustment before scooping her daughter off the floor and placing the child in her lap, poised to receive their company. Sulin’s friends were women of wealthy families who were native to Shenkuu, like Sulin herself; all of them had small children. The women soon seated their children on the carpet nearby to play and proceeded to drink their tea and exchange the familiar gossip. Three small children accompanied their mothers, and sat around Mirsha. The two young boys, a Nimmo and a Lutari, were a few years older than Mirsha. The third child was a small pink Usul who, like Mirsha, was about two years old. As Sulin and her friends chatted, the two boys began to play a game, which involved tossing a small rubber ball back and forth and “scoring” by throwing it into the narrow space between a nearby armchair and table. The two girls watched as the ball passed back and forth between the boys. It happened so fast that Sulin and her friends didn’t see it the first time. The ball was flying through the air, sailing into the arms of the Nimmo when, out of nowhere, young Mirsha leaped to her feet, jumped forward, snatched the ball from the air, and threw the ball towards the “goal”. It sailed into the small space and landed perfectly. The ladies noticed nothing, but Lai, who had been bringing in another tray of food, gasped in surprise, and the Nimmo who had been preparing to catch the ball let out a disappointed wail. Both of these sounds caused the women to fall silent and look over at the children, wondering what could possibly have happened. “What is the matter, Lai?” asked Sulin, while the mother of the distressed child rushed to him. “It was unbelievable,” repeated Lai. The crying child was quieted at last, and deposited on the floor once more. The two mothers returned to the tea table, and conversation resumed. This time, however, the mothers kept a close watch over the children, and several minutes later, they were all watching when Mirsha stood up and repeated the feat, apparently pleased with herself for joining in the boys’ game. This time, Lai was not the only one to gasp in astonishment. “And she’s managed to place the ball in their little goal every time!” said another. As the mothers continued to gape, Mirsha joined in the game with the boys. Despite the fact that they could walk and little Mirsha could only toddle, she succeeded in maneuvering the ball away from them and scoring several more times. All of the children seemed to be enjoying the game, but Mirsha most of all. The Gnorbu’s vivid purple eyes shone with excitement. Sulin had to admit that she had never seen her daughter look so thrilled with any game before, yet she was puzzled at her daughter’s odd behavior. When the afternoon was over, the incident was quickly forgotten; but it would resurface, years later, in Sulin’s memory. Sulin Grelinek would always remember that day as the moment when her daughter discovered her love and talent for sports. The eight-year-old Gnorbu rushed into the house, her long brown hair flying wildly behind her. “Coming,” she gasped, reaching the dining room. “Sulin,” said Mirsha’s father, Hynn, “perhaps we can have this discussion later.” Reluctantly, Sulin allowed Mirsha to sit down to dinner in her dirty dress, but continued to berate her daughter about the state of clothing throughout the meal. Hynn Grelinek, a fairly wealthy merchant, was not as concerned about Mirsha’s obsession with sports as Sulin, who didn’t think that such a brutal and dangerous game was fit for her daughter. Sulin had tried to get Mirsha to be interested in music, art, poetry, or academic occupations, all of which she considered suitable for her. She would even have been content if Mirsha showed an aptitude for running a shop and being a merchant, like her father. But Mirsha’s only interest, from the young age of two, had been sports, and Yooyuball in particular. Sulin and Hynn could not bear to see their daughter unhappy, so they had allowed her to play Yooyuball every afternoon with some of the other children in the neighborhood, but both tried to discourage her from it. “How remarkable,” said Sulin, who had no idea what Mirsha was talking about. There was stunned silence at the dinner table. Mirsha looked back and forth between her parents in confusion, wondering why they were silent. “Won’t that be great?” she ventured, her confidence gone. “Why not?” asked Mirsha, utterly confused. “But playing in the Altador Cup is what I want to do,” said Mirsha firmly, glaring at her parents, her jaw set in determination. They knew that look well; Mirsha had always been headstrong, and they had seen this stubborn expression many times before. Mirsha said nothing more about Yooyuball for the rest of the night, but her decision had been made. She was going to be a great Yooyuball player, and no one could tell her otherwise. She was determined to prove her parents wrong. Mirsha and her three friends stood in the center of their improvised Yooyuball field, set up in the massive backyard of one Mirsha’s friend’s homes. Across from them were four other young pets, whom they had invited to be their opponents for the game that day. “Ten,” snapped Mirsha, sizing up her opponents. Mirsha was the youngest of the eight pets who had assembled today, and she was also one of only two girls. Mirsha’s eyes narrowed. She liked the challenge the Skeith presented. He would come to regret those words. “Mirsha’s the best forward in Shenkuu!” said one of Mirsha’s friends, coming to her defense. Mirsha’s jaw clenched, and her eyes glimmered. Her friends exchanged smiles; they were quite familiar with that expression. They knew Mirsha would never lose the game now. Mirsha smiled too, and her competitiveness showed in her expression. The Skeith, puzzled by her reaction to his words, had stopped smiling. “I’ll prove it,” said Mirsha. The bespectacled faerie looked curiously at the thirteen-year-old Gnorbu in front of her. Mirsha sat, perfectly poised, upon the chair, looking at the faerie expectantly. Behind her stood a Buzz named Lai, the family butler, who had provided Mirsha’s transportation to the Faerieland Employment Agency. “You’d like to apply for a job,” the faerie repeated, looking down at the application Mirsha had given her. “Is that a problem?” Mirsha asked politely, sounding far more mature than she appeared. “Do you have any idea how much such training costs?” asked the faerie in bewilderment. The faerie started to say something, but stopped when she saw the look on Mirsha’s face. Her violet eyes glinted, and her features expressed a level of headstrong determination that the faerie had never seen before. Lai, watching the faerie’s expression, grinned. He found it amusing when people met Mirsha for the first time; they were often stunned by her ambition. Mirsha Grelinek sat in the locker room of the Colosseum, dressing in her team uniform. Holding the red-and-gold jersey up to her face, she smiled as she remembered the dresses she’d played Yooyuball in as a child. “You ready, Mirsha?” asked Antola Maeir with a smile. “Always,” said Mirsha, returning her teammate’s smile. Over the loudspeaker, the voices of the disco Ixi and red Grarrl announcers drifted down into the locker room. 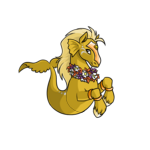 “But the big question today is, does Grelinek have what it takes to lead her team to victory?” the Grarrl concluded. Mirsha’s jaw clenched, and her teammates grinned. The Grarrl’s words had given Mirsha the challenge she needed. Ambition and determination had certainly contributed to Mirsha’s success, but no one knew better than her teammates that stubbornness, competitiveness, and inability to back down from a challenge were just a few of the other traits that made her a star. An interview with the one and only Fyora.